How to check my game progress? To check your game progress, simply tap the “log” button on the top menu bar and check the latest entry for your next destination. 1. Know your enemies: those that are substantially weaker than you are marked with a grey flag, those that are about the same level as you are marked yellow, those marked red are ones that you should consider to avoid. 2. Use Defense Matrix (DM) and Repair Ship. DM is a protective shield that blocks all incoming attack and it can get recharged when turned off. Repair Ship recovers your ship’s SP instantly during battles. 3. Add a wingman ship to your fleet which attacks your enemies and shares some damage for your flagship. Simply build a new ship in the shipyard and assign it the wingman ship in the “fleet” menu in a starport. 1. If you do not want to engage in battles with certain pirates, hold the “turbo” button at the lower right corner and enter the nearest starport or stargate quickly. 1. Rob the transport ships. They are weaker than other pirates. 2. Accept missions in the Information Center. You will be rewarded with money or equipment. Equipment earned in missions are often better than those found in the shops. 3. Pick the easier missions such as trailing (colored green in the missions menu) that do not involve battles. 4. If you have a transport ship, you can take the smuggling missions (colored purple) that require a large cargo hold. How to build a new ship? 1. Go to the shipyard and check what ships are available there. You can see what materials, blueprints, and how much money is required to build the ships there. 2. Choose a ship and click the “build” button to build the ship.If the “build” button is unavailable, either you do not have the blueprint, materials or money required or the level of the shipyard is not high enough. 3. You can build more sophisticated ships by leveling up the shipyard. 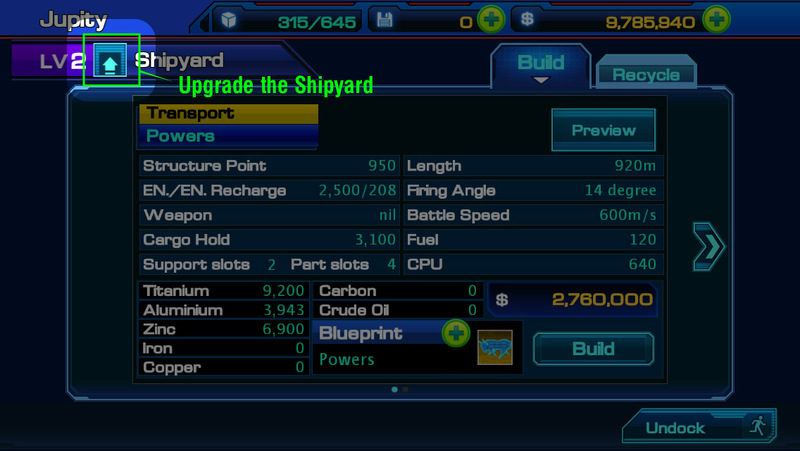 Simply tap the blue arrow icon next to the level of the shipyard UI and invest money to upgrade it. You need a blueprint to build a new ship. Blueprints can be acquired in battles against pirate groups like the Blackbeard, Elhibor, Babyface Syndicate, Qayzan Fighters and Dralomee Defenders. The stronger the pirate fleet you encounter, the greater the chance you can obtain better blueprints. 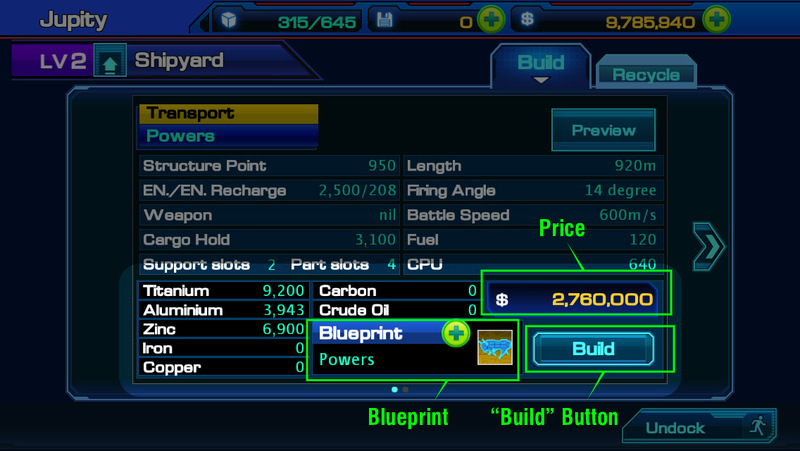 Besides robbing pirate fleets, you may also purchase blueprints in the blueprint store by credits. Materials can be purchased from the mining plant of any starports. What is Dock and Wander? In the outer space, when you get close to a planet, there are two options: “Dock” and “Wander”. 1. 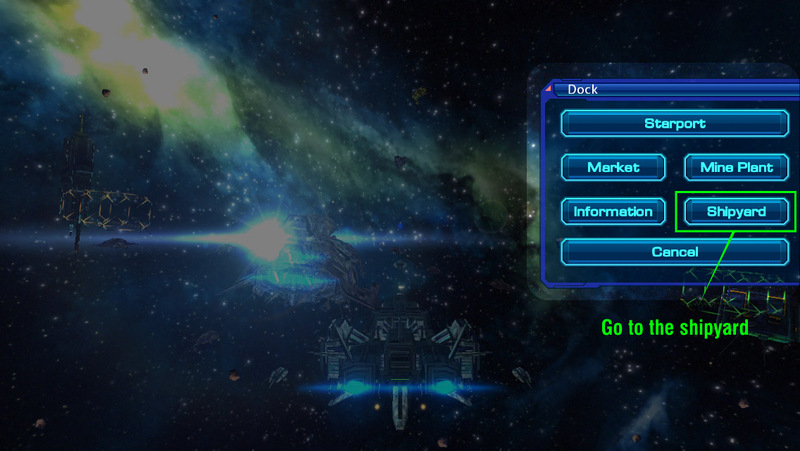 Tap “Dock” to enter the starport directly for repairing and equipping your fleet. 2. Tap “Wander” to explore all the planet’s facilities such as the starport, market, information center, shipyard and mine plant. A Golden Route is a path indicating that if you buy specific goods from certain starport and sell it in another starport, you earn a decent sum of money. You can get the hint of golden routes from the “Golden Route” menu. Note that your desired goods may not be available if the level of the market is not high enough. What if I cannot complete the mission? If for some reason you cannot complete the current mission (e.g. not enough cargo hold to load the goods, or the opponent is too strong), you can abandon your mission without penalty. After abandoning a mission you can freely accept another mission. You can take the same mission again at any time later. There are five types of ships that can carry weapons. Namely (from smallest to biggest) Frigate (FG), Destroyer (DS), Cruiser (CS), Battleship (BS) and Battlecruiser (BC). Bigger ships have higher Structure Point/SP and more equipment slots for mounting weapons, support devices or add-on parts.\nTransport Ships (TS) are a special ship type for loading a large amount of trading goods. They cannot be equipped with weapons.